A proposed high-speed train between Houston and Dallas on Thursday announced its midpoint, even as common ground with opponents near the proposed Roans Prairie stop remains elusive. 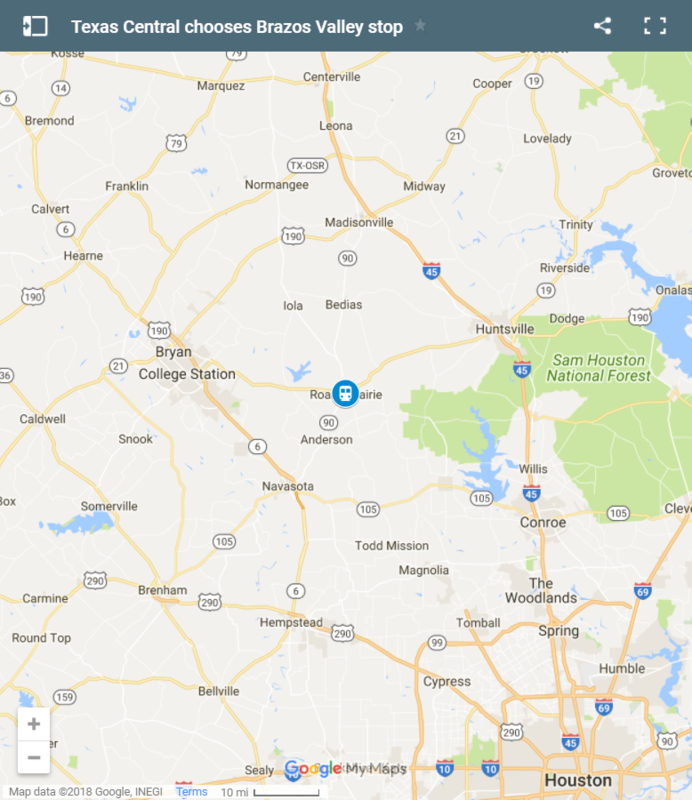 Texas Central, the company proposing the Texas Bullet Train, said the only stop between Houston and Dallas will occur at a 60-acre site along Texas 30, just west of Texas 90. The spot is about midway between College Station and Huntsville, officials said. The announcement comes 10 days before a round of meetings to discuss the project, coordinated by the Federal Railroad Administration, following the release in December of an environmental assessment of the train line. The federal agency must still approve plans for the project, estimated to cost at least $12 billion. Public meetings start Jan. 29 in Dallas and move south. A meeting in Houston is planned Feb. 5. The so-called Brazos Valley stop acts as the only other place people can hop aboard. “This will drive growth in Texas not only to the big cities but also to the areas around the station. It’s going to be very exciting,” said Brady Redwine, a vice president of Texas Central, in a statement. Grimes County residents, however, have been some of the staunchest critics of the project, which has faced stiff opposition from affected landowners and many rural residents who say the line is unnecessary and ruinous to their rustic surroundings. Roans Prairie is in fact in Grimes County. One way of looking at this is that it’s a direct response by Texas Central to the criticism that the rural areas between Houston and Dallas where some land will need to be taken for the right of way will see no benefit from the train line. If this goes as planned, then one of the hotbeds of such criticism will in fact get something potentially quite substantial out of this. That could be quite the construction project, on that large tract of basically empty land. Put in the station, some retail, a place to eat, shuttle service to College Station and Huntsville and maybe one or two other places, and now you’ve got a lively enterprise in the middle of what was once nowhere. Will it change any minds? Can’t hurt to try. The Brazos Valley stop has been in the plans for years and Roans Prarie has been the spot for quite some time. What is news is the $199 average one-way ticket price published in the DEIS. That might change some minds.